National Journal of Physiology, Pharmacy and Pharmacology (NJPPP) is an open access, peer reviewed, online and print journal. The journal is going to be published twice a year at the initial stage and at later stage frequency of publication will be increased. 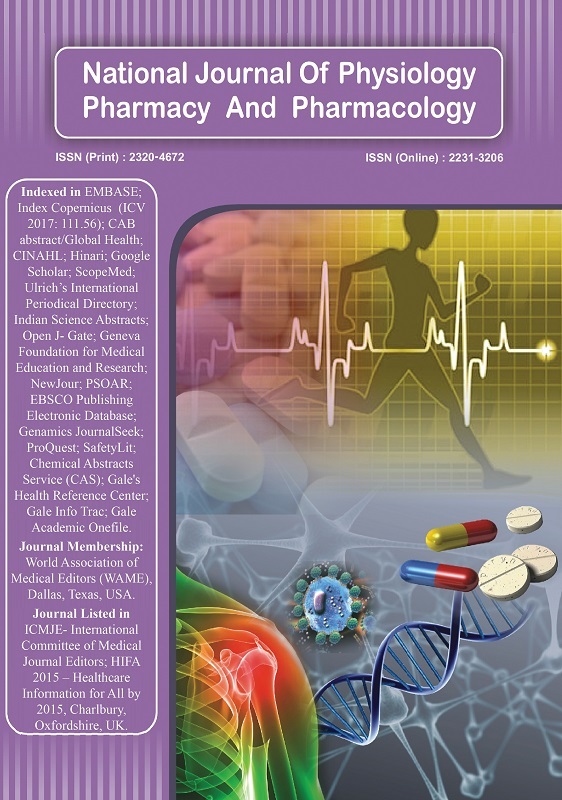 The journal is indexed in EMBASE, Indian Science Abstract, Open J- Gate, Geneva Foundation for Medical Education and Research, Ulrich’s International Periodical Directory Index Copernicus, Index Scholar, ProQuest, JournalSeek Genamics, SafetyLit, CAS etc. The NJPPP aims are to provide opportunities for free exchange of ideas and information of the highest quality of research and academic work. To achieve this goal we allow free access (Open Access) to its contents and permits authors to self-archive final accepted version of the articles on any OAI-compliant institutional / subject-based repository. This journal will welcome the original articles, review articles, short communications, letters, education forum, guest editorials, books reviews from the field of clinical physiology, experimental physiology, medical education in physiology, pharmacy practices, social pharmacy, experimental pharmacy, pharmacy education, pharmaceutical marketing, clinical pharmacology, experimental pharmacology, clinical trials, and education in pharmacology etc. Log into your account if you are already a registered user. Password Sender. Enter your e-mail address to get an e-mail with your account information. This page is provided and mainteined by eJManager. Copyright © 2012-2019 eJManager All Rights Reserved. Subject to change without notice from or liability to eJManager.